Eluxury time sells luxury watches online. 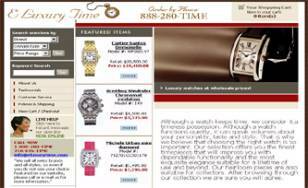 Bitochon’s New York web design allows site visitors to shop for luxury watches and pay by credit card 24 hours a day. Customers can browse different brands and models of watches and there is an advanced search feature if you are looking for that hard-to- find watch. The advance search feature helps customer to search the entire website quickly and easily. The website was designed and deveoped by Bitochon to include an easy-to-use administration interface for site updates and maintenance.